The Sumo Collection is defined by its simple yet powerful lines sculpted with a well proportioned stainless steel base and legs that are matched to thick and wide pieces of teak. 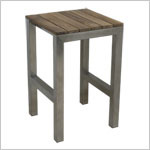 The Sumo Bar Stool is a perfect complement to the Sumo Bar Table or as an addition to your bar height table. The stool has been ergonomically designed for comfortable seating, including carefully recessed stainless steel support to allow you to rest your feet on one of 2 foot rests. The 2 foot rests (front and back) are set at slightly different heights to suit all users.